Douglas Edlin, associate professor of political science, received the 2013-14 Distinguished Teaching Award during pre-Commencement ceremonies. The award, which recognizes excellence in teaching, is the highest honor given to a Dickinson faculty member and is determined by faculty voting and approval by the president. The recipient also receives a cash honorarium. 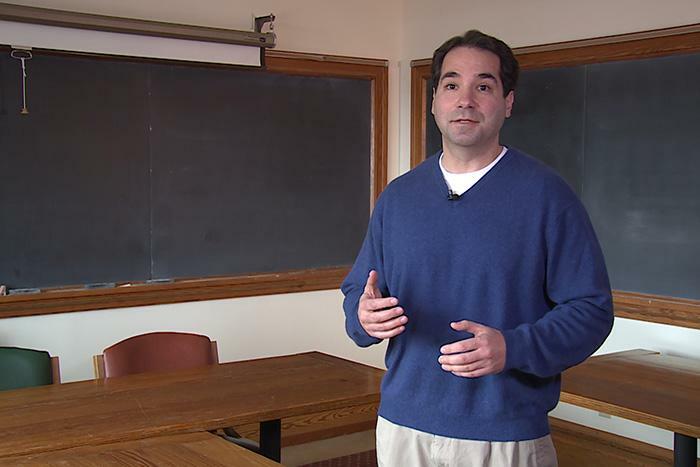 “Teaching at a college with so many extraordinarily talented and dedicated faculty members, it was a shock and a very humbling experience to receive this award,” says Edlin, who in 2008 received Dickinson’s Ganoe Award for Inspirational Teaching, a faculty award determined by secret-ballot voting of the senior class. Edlin also has received the Student Senate Outstanding Professor Award and the political science department’s professor of the year award six consecutive times (2006-11). The citation naming Edlin as this year’s Distinguished Teaching Award-winner notes his ability to help students see all sides of an issue, become critical thinkers and find their voices. One student when asked if he would give Edlin a thumbs-up responded that he needs “more thumbs.” The citation also notes that faculty members in neighboring offices are in awe of the long line of students waiting to see Edlin and the undivided attention he devotes to each. One administrator remarked that students often count having discussions with him as a highlight of their Dickinson careers. Edlin, who currently serves as political science department chair, joined Dickinson in 2004 as assistant professor. In 2008, he was promoted with tenure to associate professor. He serves as the faculty coach of Dickinson’s successful Mock Trial team, taking it to the American Mock Trial Association national tournament for the past five years. His scholarly interests include comparative constitutionalism, the judicial process and judicial review, the legal and policy issues raised by developments in assisted reproductive technology and the politics of race and gender in the U.S. Edlin speaks on topics that include the philosophy of law, comparative law, the judiciary and law & policy. He also teaches courses in the areas of law & policy, policy studies and policy management. Edlin holds a bachelor’s degree from Hobart College and a master’s from the University of Pennsylvania. He graduated from Cornell Law School with his J.D. and earned a Ph.D. from The University of Oxford in 2002.